Look at what the cat and mouse dragged in! It’s an all-new collection featuring 30 hilarious Tom & Jerry episodes for the whole family to enjoy. So get ready for a rowdy reunion when Jerry’s Uncle Pecos comes to visit in Cry Uncle. Cat got your tongue? Maybe its Cat Got Your Luggage when Tom works as a bellhop in a fancy hotel but Jerry is a guest that’s sure to overstay his welcome. Then in A Mouse in the House, Tom and fellow feline Butch are both on the hunt for Jerry and to the victor go the spoils. So sit back, relax and hide the frying pans and mousetraps, this one is going to be a laugh riot! Since 1940, a certain cat and mouse have worked their way into the hearts of millions with their hilarious–and super violent–animated antics. 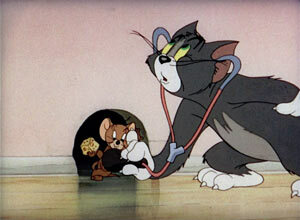 Tom & Jerry have been a lovable pair that have certainly come a long way since their debut over 70 years ago. There’s been quite an evolution of the cartoon shorts over the years and depending on when you’ve been exposed to this dynamic duo, you may prefer one version of them over another. A new DVD release, titled Mouse Trouble, named after the 1944 Oscar-winning short, compiles 30 animated shorts from the 1940s on down to the 2000’s. 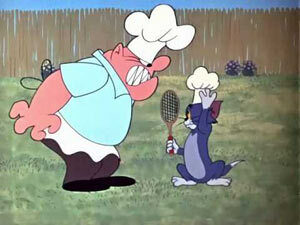 The generation-mixing of Tom & Jerry cartoons here can be a bit jarring at times. To be honest, I’ve always preferred the Hanna Barbera era of Tom & Jerry that spanned 1940–1958, and often watched it on TV as a kid growing up in the 80s and 90s. However, I had always really, really hated the early 60’s shorts from Gene Deitch/Rembrandt and would either turn them off or skip them if they happened to be on the show at the time I’d tune in. The DVD compilation Mouse Trouble sadly opens with “Down and Outing,” one of those infamous shorts from that era. There’s a distinct 60’s feel to it with bizarre sound effects and flat, seemingly lazy animation — and Tom is even in tears at the end of the story. It’s just awful. Thankfully, things pick up from here. The Hanna Barbera classic golf tale “Tee for Two” is next and then it jumps ahead to 1967 for the Chuck Jones era “Rock ‘n’ Rodent,” featuring Jerry in a nightclub-style band. The next few follow the same Chuck Jones style, offering a similar look and feel to the original Grinch cartoon. 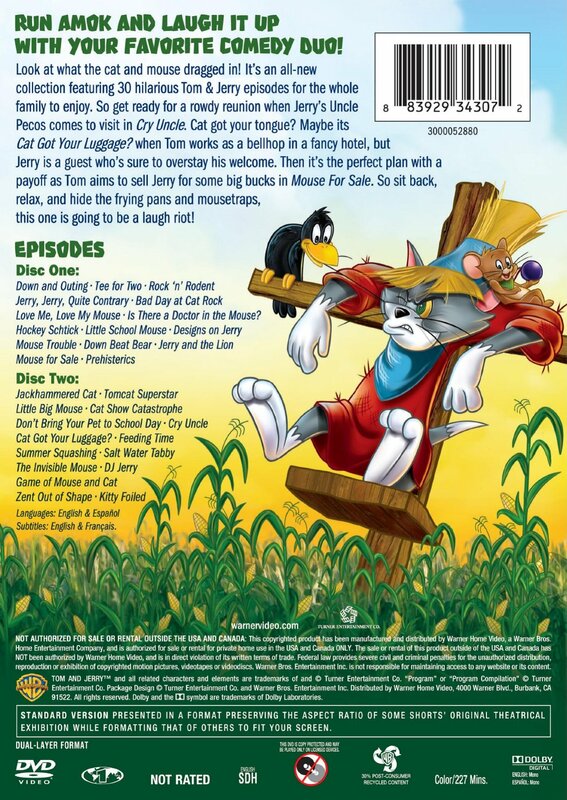 Then we’re catapulted to 2008 for “Hockey Schtick,” which is also the first Tom & Jerry cartoon on here featured in widescreen, and it has Tom trying to play hockey on an iced-over pond (with some nods to one of my favorite Tom & Jerry episodes, “Mouse In Manhattan,” which sadly isn’t on here). It’s, again, kind of jarring to jump from the 60s to 2008 in style, music, and execution, but some T&J fans will probably appreciate the variety. The rest of Disc One is mostly classic episodes from the Hanna Barbera era, from different decades during that time period. 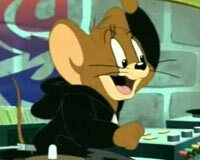 Classics like “Mouse Trouble,” “Little School Mouse,” and “Jerry and the Lion” are just wonderful additions. But Disc One ends with the narrated, widescreen, 2006 release, “Prehisterics,” which is arguably less memorable and a weak way to end the disc. However, it really sets things up for what to expect on Disc Two. Disc Two is a sad one for any lover of the oldies. Most of the selections here are from the 2006-2008 modern era, with some of them being standard-sized and not widescreen, curiously. “Don’t Bring Your Pet to School Day” and “Cat Catastrophe” are examples of this, and they utilize weird music and semi-voices for the otherwise nonvocal characters. They’re unfortunate examples of how the stories are much more positive and less witty. It isn’t until the tenth episode on this disc (out of fifteen) that we get to see another classic, “Salt Water Tabby,” in which Tom tries to impress a girl at the beach and Jerry is his foil. “The Invisible Mouse” is another classic that is a highlight, in which Jerry finds and paints himself with invisible ink in order to harass Tom. Sadly, it’s mostly downhill again from here as “DJ Jerry,” which sees Tom protecting a record store at night; “Game of Cat and Mouse” and “Zent Out of Shape,” which features Tom as a… Samurai; all are taken out of the more modern era and are just all-around weaker efforts. Thankfully, we’re left with another classic in “Kitty Foiled” as Jerry teams up with a yellow bird that Tom is terrorizing. 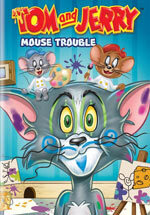 If you’re a diehard Tom & Jerry fan, Mouse Trouble is a nice collection of almost 230 minutes of Tom and Jerry tales. The eras they’re pulled from run the gamut of over 60 years, so you’re going to get a taste of nearly every age of the Tom & Jerry legacy. But Mouse Trouble seems to have been quite randomly thrown together with little direction as you get a shuffled compilation of cat-and-mouse chases. It’s a nice sampler of the different decades of Tom & Jerry escapades, but if you only prefer one style of Tom & Jerry over another, there are probably other releases available that will better satisfy your tail-biting, foot-smashing hunger. Posted in DVD, ReviewsTagged 3 stars, animated, cartoon, cat, cat and mouse, cats, Chuck Jones, classic, DVD, Family, Hanna Barbera, Jerry, Jerry Mouse, modern, mouse, Mouse Trouble, Tom, Tom & Jerry, Tom & Jerry Tales, Tom & Jerry: Mouse Trouble, Tom Cat, Warner Bros.